St. George Orthodox Christian Church is a community where the Holy Trinity - the Father, the Son and the Holy Spirit - are worshiped and preached. We are the continuation of the Church founded by Jesus Christ. We maintain the True Faith and Holy Tradition handed down from generation to generation from the time of the Apostles. Click here to watch the Divine Liturgy Live Stream every Sunday morning at 10a via Facebook. Previous Live Stream Services are saved on the St. George Houston Facebook page under the "Video" section. Previous Gospel Readings & Sermons are saved on the St. George website here. Download our "My Church by echurch" app from the app store (St. George keyword is “SGOCC APP”) or text “SGOCC APP” to 77977. If you need sign up assistance, see Eddy in the Hall after Liturgy. Click here to create your login to mySTGEORGE. Available for purchase outside the Narthex starting Holy Monday, April 22, and throughout Holy Week, before services begin. Holy Friday, April 26 and Monday, April 29. Help keep the vigil at the tomb of Christ on Holy Friday after 7p Lamentations until 10a Holy Saturday. To pick a time slot, see the signup sheet on the wall by the Library. Holy Friday after 7p Lamentations until 10a Holy Saturday. Please RSVP with Chris Al-Dehneh. Please remember the food pantry as part of your almsgiving during Great Lent. Immediate needs: canned meats: tuna, chicken, ham, spam; peanut butter & jelly; spaghetti sauce; cereals; instant potatoes/rice. Please pick up your alms box to use every day during this Lenten Season. You can also donate online via debit/credit/ACH on the St. George website or app by selecting the Food for Hungry People fund. 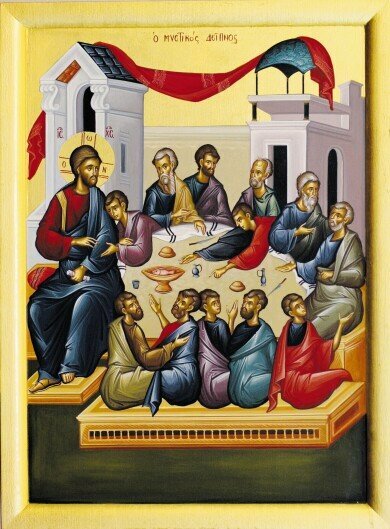 12p Sunday, May 5, 2019 following Divine Liturgy in the Fellowship Hall. $15 per plate. Please join for Fajitas & Margaritas. Tickets are for sale Sunday after Liturgy or by contacting George Zaibaq, drzaibaq@swbell.net. Hosted by The Order of St. Ignatius. Sunday, May 5 after St. George Day Lunch, there will be a Bible Bowl competition for all church organizations. A team consists of three members. Start studying Saint Paul's Letters now. Please see Chris Al-Dehneh for any questions or to register your team. 11:30a Wednesday, May 8. SOLD OUT. Sunday, May 19, 2019 after Liturgy we will recognize our graduates of High School, Colleges & Universities, both of undergraduate & graduate programs. In order to receive this recognition, you must turn in your information no later than Sunday, May 5, 2019. Forms available outside the Narthex must be turned in to Chris Al-Dehneh (chrisaldehneh@gmail.com). This form is also available online; please click CLICK HERE for link. 9:30a-12:30p June 10-14 at Annunciation Cathedral. $35/child. Would you like to advertise your skills or services to other St. George parishioners? In an effort to pair parishioners that are looking for a specific service or talent with parishioners offering those services, we are creating an “Occupation Database”. If you would like to be a part of our “Occupation Database”, please CLICK HERE and fill out the “Offer Services” form. Once a satisfactory data base has been established, a “Looking for Service” form will be available to pair both parties. SOYO is collecting for the Houston Public Library. We’ll be accepting all books in good condition, vinyls/CDs, DVDs, & any tech/video games. Service hours available for donations. Visit www.campstraphael.org to register. There will be groups going from Houston all three sessions, St. George will officially be attending 2nd Session (July 7-13). A long standing female parishioner in her 60s is in need of a female roommate to share her southwest area home. Free room & board. Please see Fr. James. Local iconographer Nick Papas is looking for a new studio space (approximately 10-15’ height x 20-50’ wide with natural light, running water and AC). Please contact Nick directly (724-396-4675). During Great Lent we are asked to strengthen our relationship to Our Lord’s commandments through prayer, fasting and almsgiving. During your Lenten journey, please consider renewing your commitment to take care of St. George, our spiritual home. Collectively, with our time, talents and treasure, we can support our beloved Church as we share the light of Christ and witness to the Orthodox Christian Faith. The Antiochian Archdiocese of North America issues a monthly magazine called The Word. To receive this magazine in the mail, you must be current in your membership at St. George. The Word Magazine is also available online at http://ww1.antiochian.org/theword. The St. George Communications Committee conducted (2) 5 minute interviews with world renowned Iconographer Aidan Hart, featuring and explaining the Crucifixion and Resurrection Mosaic Icons at St. George Orthodox Christian Church. To listen to Aidan speak about the Crucifixion Mosaic Icon, please click here. To listen to Aidan speak about the Resurrection Mosaic Icon, please click here. The St. George Mosaics and Artist Aidan Hart were recently featured in an article for the Houston Chronicle. To read the article, click here. The St. George Mosaics and Artist Aidan Hart were recently featured by Fox 26 Houston in a story about our Sanctuary Mosaics. To watch the video, click here. Artist Aidan Hart has recently installed two new mosaics. We have 30 Ministry Teams/Organizations at St George. Each of them would welcome your commitment of Time and Talent. For more information or to sign up for one or more of these ministries, please visit the table Sunday after Liturgy, fill out the form online, or call the Church Office. To see the list of St. George ministries, please click here. To sign up for one or more of these ministries, please click here. Marriage is one of the 7 Holy Sacraments of the Church, and the Wedding Crowns, or Crowns of Martyrdom, signify a Groom and Bride being crowned as the king and queen of a new family in faith with Christ. The bookstore is pleased to announce that we now carry Wedding Crowns.